I have a Google Analytics account, how do I start collecting visitor data? This article assumes you have successfully signed up for a Google Analytics account. Google Analytics is tightly integrated into Pulse Commerce. This integration requires no cut & paste, no coding, etc. You simply enter your Google Analytics account code into the field provided and Pulse Commerce does the rest automatically. Ensure you have a Google Account. If you are not already signed up with Google, you may sign-up here: google.com/accounts/ManageAccount. Once signed-up, go to google.com/analytics and create an Analytics account. You will receive a Google Site ID (likely a code similar to UA-1234567-1). In Pulse Commerce go to Marketing > ANALYTICS & MEDIA > Web Analytics > Google Analytics, where you will find the Google Analytics activation screen. To enter your Google Analytics Site ID click Edit button. 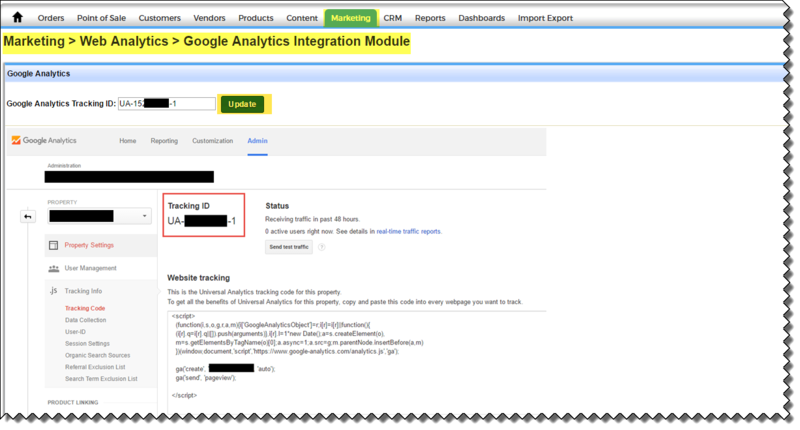 Enter your Google Analytics Site ID in the field provided, and click Update. It will take 24-48 hours for Google Analytics to begin collecting data. Go to your Google Analytics account to view your statistics: google.com/analytics.